Some of you are probably pretty offended right now… you are just getting a chance to sip on your pumpkin spice latte and here I am talking about Christmas? Just not allowed, right? While is seems early, the commercialism and rush of the Christmas season is about to be upon us, and I feel like I need to get a slight head start. Sometime back in May, God started working in my heart on this. Stirring me. Challenging me. Causing me to ask questions about the way we give at Christmastime. It has been exciting as I have began to explore where God is leading me in all of this, but it has also been overwhelming. We love gifts. We love Black Friday. To be honest, we love to spend money at Christmas. And no worries, I am not going to say stop our gift giving all together… there is something so special in it when done in love and sacrifice. I am just going to say we take time to reevaluate. To take a look at how we are giving. And this is our journey too. I have a general outline for this series… but to be honest, it has yet to be written. It may even change as we go! I am learning here and excited to share with you along the way! And I will just leave you with one more thing- this video from the Advent Conspiracy… please take a minute to watch, it is awesome! I LOVE this idea! Looking forward to taking the challenge with you! 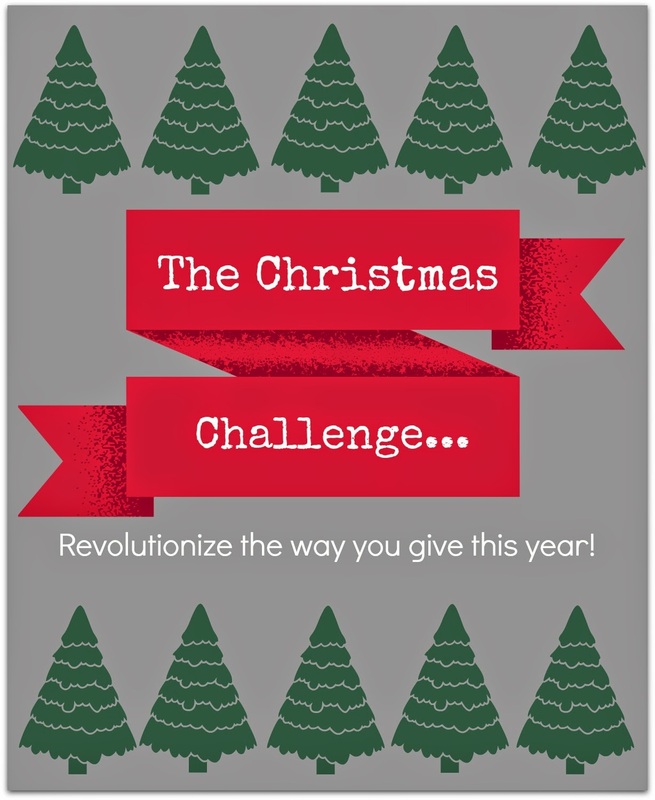 Thank you for following along… I am SOOOOO excited you have joined the challenge! Agreed… hopefully not taking away gift-giving by pondering it some more! It has gotten so commercialized. It is so true. Gift-giving can be something that is so special and sacrificial… but right now it is just a big commercial!